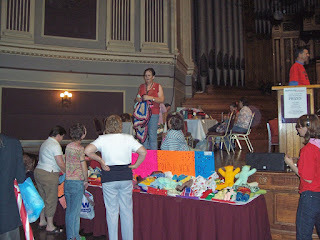 You may remember that in June this year, I wrote about Knitting for Brisbane's Needy attending the Homeless Connect Day at Brisbane City Hall. 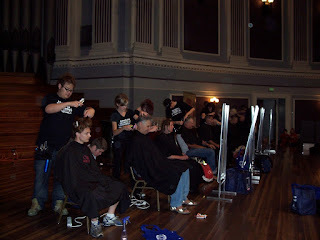 Well the Lord Mayor of Brisbane organised another one - and my, he did the needy people of our city proud! This time there were even more services available than before - lots more organisations gave their time and their help to others less fortunate. have filled those tables again and again! And again I have to say - even the poorest of people were not greedy - they would not take too much, so that another person could benefit too! There was no unpleasantness, in fact there was such a carnival atmosphere, it was a very happy day. There was a whole section of the auditorium roped off and there were various sporting activities taking place, there was basket ball, boxing and even a hula hoop contest - which was very noisy and a lot of fun!! 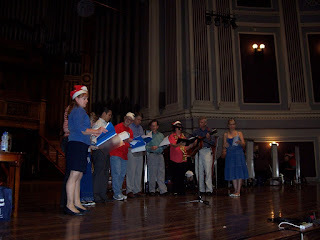 And a choir sang Christmas Carols, which went down very well too! Well, have had nearly a day to recover from another emotional day at the second Homeless Connect Day that we have participated in. 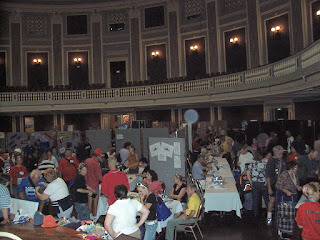 For newer members the Brisbane City Council sponsor, organise etc a Homeless Connect Day in which all sorts of support services who can assist the homeless come along voluntarily and offer their services, from legal aid, accommodation "finders", Centrelink, doctors, hairdressers, Red Cross etc with second hand clothes, sporting identities who normally have some sort of "sport" for the homeless to try, such as hula hoop yesterday (and NO I didn't give it a go!! 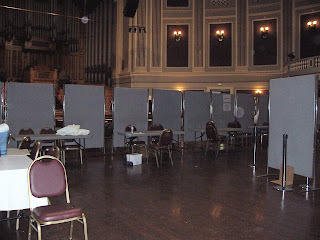 lol) This was the third such day that the BCC have put on in the Town Hall. It commences with a free breakfast for the homeless at 8 am, and upstairs breakfast and official welcome from the Lord Mayor (or the Lady Mayoress), Councillor Bellingham etc. The "doors" open at 9 am for the homeless to start coming through to access whatever service they may be in need of. Some of our members and myself attended our first one in June of this year after being asked if we would like to participate. It was such an overwhelming, emotional day and when it was announced there would be another one in November, we were all eager to do it all again, with help of members unable to attend! 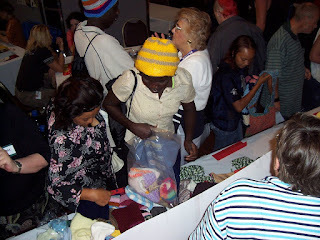 Yesterday we took over 450 donations - beanies, scarves, toys, toiletry bags, socks, some baby clothing, etc. As well, members who came along during the day brought donations to, so in all we had over 500 donations there, and I came home with only 6 items, some of them being childrens slippers (obviously wrong time of the year for them). Once again we were blown away by the gratitude of the homeless and also their politeness and a lot of them, even though they may have been wanting two items, only took one, because "someone else may want the other one"...etc. 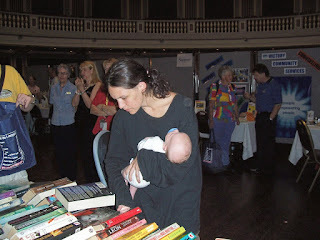 I noted that there were a lot more families there yesterday, including one young couple with a very young baby (the baby didn't look well and the parents were so young they were only babies themselves!) but found out from one of the other service providers that this little family were living in a car, as her parents kicked them out when they found out the girl was pregnant. I know Jean R was feeling very emotional, particularly after one young lady, gave her a huge hug and kept saying thankyou, thankyou, for the lovely lacey scarf Jean handed her and showed her how to wear it to keep her shoulders warm of a night. My most memorable person yesterday was the lady who is homeless, but is receiving chemo for cancer. She has had a double masectomy, which she discreetly showed me (not that I really wanted to see, but she just wanted me to see it ... she couldn't believe I spent the time to chat with her for quite a while). Only the day before she had been told she now has secondary cancer in her liver and stomach!! But what she really wanted was something for her about to be born grandchild!! This lady almost brought me to tears, (well I did but when I got home!) with her story of her life and now what she is suffering through. There were many more stories that were shared. One of our newest members Carmel came along after lunch with her delightful 18 year old son, Ryan (what a charmer!! lol) and she brought 6 beanies with her. No sooner had we put them out on the table that she noticed someone taking one of her beanies, couldn't believe it would go so quickly. Within about 10 minutes all of her beanies had gone!! Think she was in a bit of shock!! One guy in particular took two, then came up to the stage to where the hairdressers were, and tried each beanie on with his sunglasses looking in the mirror the hairdressers had! We noticed he absolutely loved the red one, he didn't take it off, and I then saw him give the other one to a guy who was having his hair cut! Can't forget to mention "Terry". Some of you may remember Yvette's and my story about this gentleman last time, who came in looking very unkempt, head down (as lots of them do), then later on he came back and we didn't recognise him, he had had his head and face shaved, been decked out in a business suit, tie, shirt, new black shoes etc. He looked a million dollars!! Well as Dianne, Daphne and I walked in yesterday this man grabbed Dianne by the arm , then me...he was wearing a shirt, tie etc and I thought "who is this??". Then he smiled and because of his missing tooth I realised who it was. He still remembered us from June. When Yvette arrived he too went up to her as well. Even though he unfortunately is unemployed and homeless again, he has kept himself clean and told me that because of last time, he has learnt more about hygiene, etc than he ever knew!! He needed a new pair of shoes, the shoes he had on orginally had the sole flapping on them, later in the day he came back to see us again and he had been given another nice pair of shoes...he was as proud as punch!! I was so surprised that he had remembered us, but he said that we had made a big impression on him when we spent time listening and talking to him in June!! 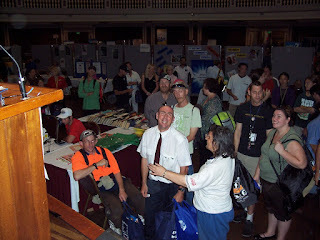 A lot of the service providers were coming up asking questions about all the beautiful things we had to give away. I had done up some of our flyers, latest newsletter etc, and the service providers were grabbing them. We got 2 contacts yesterday who would be grateful for any donations we can give them. One was from a community outreach program, a lovely Canadian lady Brenda. They are situated at New Farm and she wants some of us to go along one day next year and see what they do, and how anything we can donate would be used. Also, a lady who works at a Women's Homeless Shelter, working with single females aged 18 upwards. She actually rang me today as well, just to ask again if we would be able to put them on our "list" of charities if we had "enough" to give them. 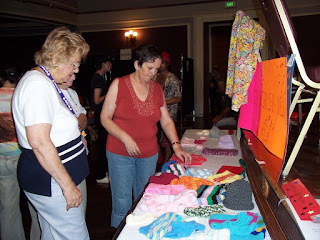 Also she wants to know if some members could go to them next year, to give lessons to the ladies in the shelter, to help them learn to knit (crochet), so that they feel they are helping themselves by being able to make themselves a scarf or whatever. I said yes, but we are going to chat early in the New Year further. I could go on and on, but won't bore you any longer!! 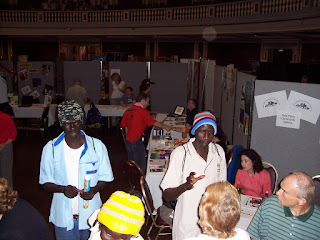 All I can say is that when they have another Homeless Connect Day (which we all hope they will), that if you can come along even for 15 mintues, you will get to experience first hand the wonder of those needy people when they realise we make all these things, new, just for them!!! I feel it has changed my life, and as Lyn has said, makes you realise how well of we are in comparison to these unfortunate folk! That just about says it all don't you think? And after it was all over, do you know, there was hardly any mess at all? I hope that the pictures give you an idea of how overwhelmingly poignant the day was - thank you to Brisbane's Lord Mayor, Campbell Newman and his lovely wife Lisa! 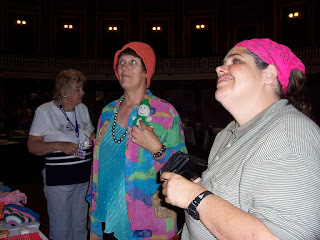 Stop press: Karen informs me that the next Homeless Connect Day has already been set for May next year! Get those needles revved up ! God Bless all of you, such an inspiration. Your group deserves a whole lot of hugs for all that you do. 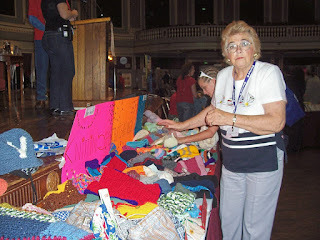 I know from first hand experience the joy spread by providing handmade items for those less fortunate. 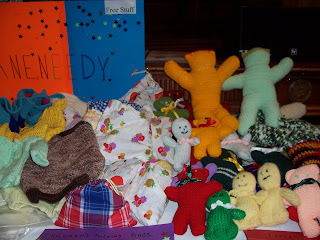 My church circle has for a number of years worked with one of the clothing closets making infant layettes and blankets. When one of my student's mother (I drive a school bus) saw me working on a little zip up the back hooded sweater, she asked me about it. I told her what it was for and she told me to keep on making them as "her" girls (she is a social work nurse working with young needy mothers) really loved and needed them. As for the little boy who wanted bubble gum flavored toothpaste, I know here in the states several of the companies that make toothpaste have a line of flavoring aimed at children and that is one of the flavors. Ask how I know with 4 grandkids. Well done K4BN. I will get some of my contributions up to Karen for the May one. Congrats to all. Once again I was in tears reading about the homeless days activities. Such a worthwhile project. Really hats off work you did. I really thankful to you for sharing this blog and lots of blessings.